We bought this heavy-duty extension cord the first time we spent a winter north, routing it up through the living room slideout seal so that we could plug a heater into the 20-amp receptacle on the pedestal. The 12-gauge wiring ensures it can handle the load of a 1,500W heater, without causing a problem. 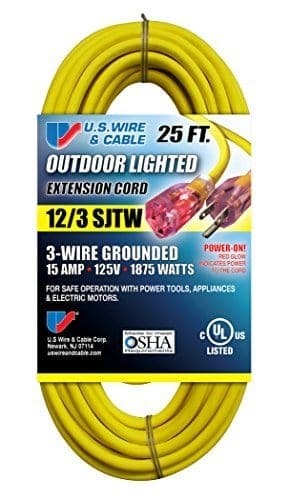 Same construction as Temp-Flex-35 cord set with the addition of power indicator light to show when power is on. Designed with convenience in mind, easily seen in day or night.